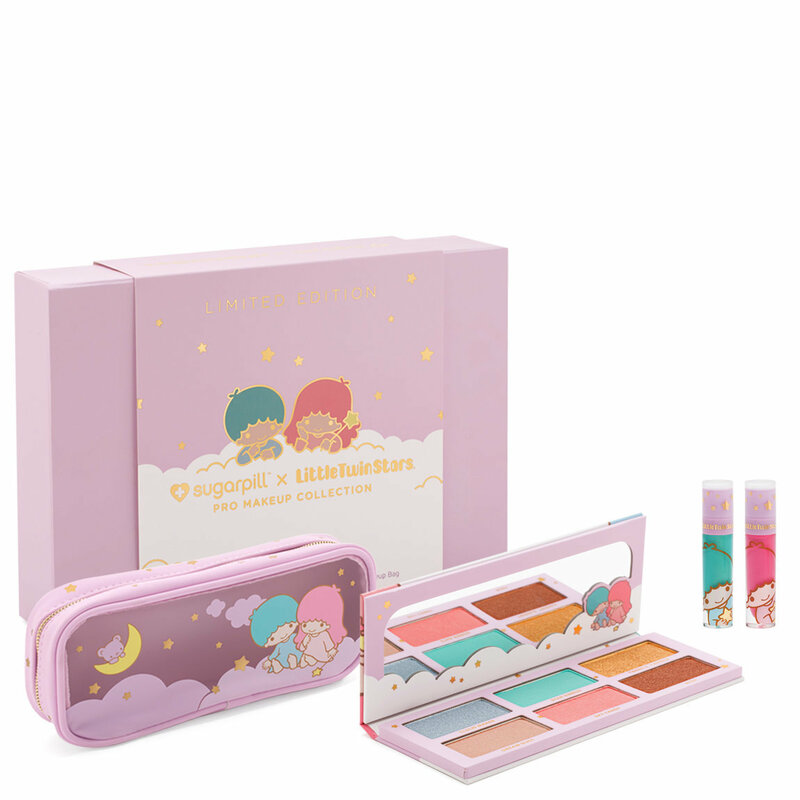 Be the shiniest star you can be with the complete celestial makeup collection from Sugarpill and Sanrio’s Little Twin Stars. Create heavenly looks with an eye shadow palette with six dreamy hues, two matte-to-sparkle liquid lipsticks, and an exclusive makeup bag, all in a collectible keepsake box. This limited edition collection is only available on Earth for a short time—once it’s gone, it won’t come back! Matte-to-sparkle liquid lip color glides on with a velvet-touch finish—just press your lips together to activate more sparkle! 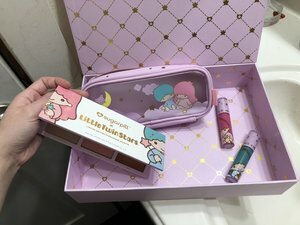 The packaging is so cute, the palette is very pigmentated and the lipsticks are amazing ( and full of glitter ). The shipment to Italy was very fast ( about one week ) and the custom didn't create any problems. I loved this experience, surely I'll buy again Sugarpill and I'll order from this site. I have played with all of the shadows and Lala and can't wait to try out Kiki! Same high quality, crazy pigmentation that we know and love from Sugarpill. They've never let me down! I really love the packaging. The star ribbon shade has to be built up. The Lala lipstick is patchy. Overall a great collection. Just not up to sugarpills quality like their other items. Suuuuper cute, high quality product, I’m in love. First of all, I immediately bought this bundle just for the packaging. The Little Twin Stars/Sanrio look is absolutely adorable and I fawn over it everytime I go into my bathroom. I LOVE that you can reuse the box it all comes in, it’s magnetic and SO adorable and sturdy, I’ll be keeping something special in it for sure! Maybe crystals or something, I haven’t decided yet. Coming off my tangent though, the palette has such nice colors. The formula is super buttery and pigmented, and blends sooo well with literally no fall out(in my experience with it so far). The liquid lipsticks smell sooo good and I just adore how bright and happy they are!! Not to mention, the makeup bag is extremely adorable and I’m using it now as a place to keep all my Sugarpill lipsticks. Thank you so much Beautylish and Sugarpill, this was my first sugar pill purchase(besides trinket and kimchi), and I’m hooked!! I look forward to what products they put out next. The product is build able and really nice colors. I wish there were more matte shades but over all really nice collaboration. Better used wet for better color payoff. It came beautifully packaged but the palette packaging had a slight dent in it. But it’s useful still. I am the biggest Sanrio fan and I am really glad this set performed. I am loving the colours a whole lot, though this is not a standalone palette.